In the last year I have been the coach of a local under14/under15 team. There were a few players that started playing in a club only recently, so the quality wasn’t that high, and the amount of players attending the sessions varied depending on the exams, school trips and other appointments of my players. Therefore it often was not possible to train team tactical topics. The following drill was created by myself when I wanted to train our pressing with only 10 players available for the session. In the drill we started with a midfield press and then situationly moved further up the pitch into an offensive press. With my team we always wanted to start with a midfield press, because most of our opponents relied a lot on long balls and played them even under little pressure and we didn’t do well at defending this. We decided to give the opponent an offer to build up the game with a low passes and didn’t press as high as most of the other teams in our league did. My players struggled a bit at maintaining the midfield press and often pressed higher up the field, but without much coordination as this wasn’t our plan. Because of that I tried to adapt my plan to the behavior of my players and situationally we pressed higher up the pitch. There are two teams, one team with four defender who are trying to build the game up against four midfielders and two strikers that are pressing them. According to the image there have to be six passing gates, two in the centre and two in each halfspace. The ones in the centre should be marked with three poles instead of only two. Its useful to use a different colour for the poles like in the picture. The blue gates are for the midfield press, which is always the start of the drill. The four build up players have three target players to reach, a “6” and two “8’s”, which are represented by the gates. With these three gates as target there is basically a 7vs6 situation, 8vs6 if you count the goalkeeper who is also a passing option. A successful pass through the pressing gate in the centre values one point for the red team, a pass through a gate in the halfspace two points. The white team gets one point if they win the ball, two points if they manage to score a goal in the following counterattack. If the press for the four build up players becomes too big, they have the possibility to pass back to the goalkeeper. Then the six pressing players have to quickly move up the pitch and start the offensive press. The yellow gates are becoming the new target while the rules all stay the same. After a succesfull pass through a gate or a finished counterattack the game always begins newly with the midfield press. Because of the number of players the drill surely has its limits and for example the adjusting of the height is secondary as there is no possibility for the build up players to attack the space behind the pressing players with long balls. The drill has mainly the aim to train the horizontal movement of the players and the pressing runs forward while closing down passing lanes. The low number of build up players also has an advantage. The defensive players have to defend less man oriented and can’t simply manmark opponents as the rules of the games emphasize the use of the cover shadow. An interesting point is that the “target players” cant move like real players. 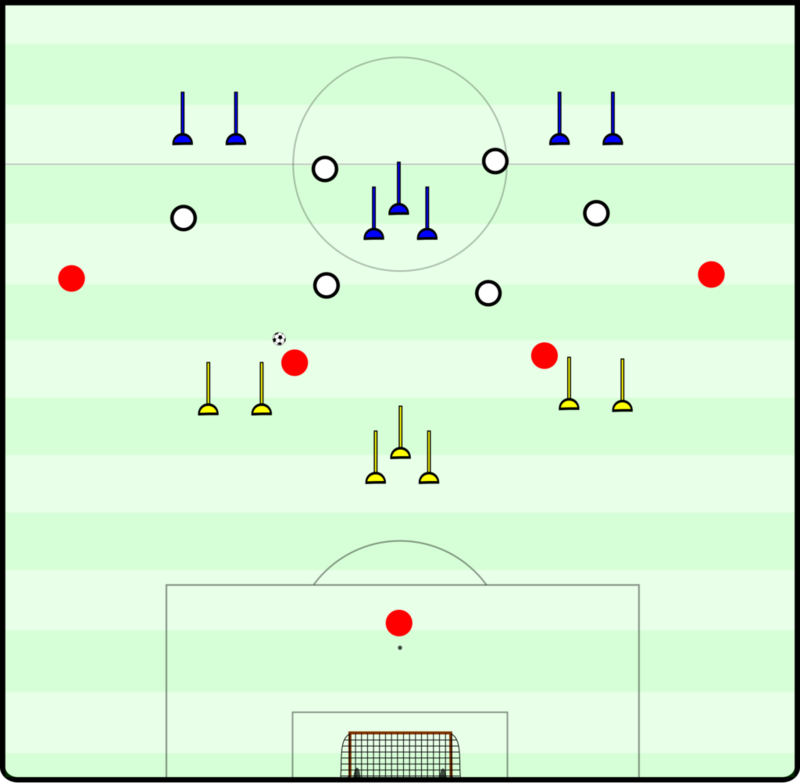 This makes the orientation for the pressing players a lot easier and therefore the drills is well suited for players with not that high quality or players that are introduced to a new defensive strategy. In our case it meant that the two strikers can orient themselves only on the centre backs. They both have to be aware of the passing gate behind them and so if one striker pressed towards a centre back, the other striker has to be positioned a bit behind him and more centrally to block the passing lane. If he then presses forward to the other centre back, he has to make sure to keep the 6 in his cover shadow. The outside midfielder on the ball near side should be positioned a bit higher than the central midfielders to keep the distance to the opposition full back shorter. He should press him diagonally from an inside starting position to block the pass to the 8. Also his timing his very important. He needs to press the fullback early, but he shouldn’t be to early as there has to be an offer to the centre back to pass to the fullback. I have coached this timing but also the distances between the four midfielders and the orientation with glimpses over the shoulder to check passing options behind their back. The focus of the drill is on the defensive aspects, but naturally you also train the build-up of the defenders. For example I didn’t include a passing gate for a longline pass of a fullback as this is a pass I don’t like much because it’s easy to press. I prefer diagonal passing of my fullback to bring the ball back to the centre or the halfspace. Because of that the passing gate in the centre is a triangle as this makes passing from the fullback to the 6 easier. 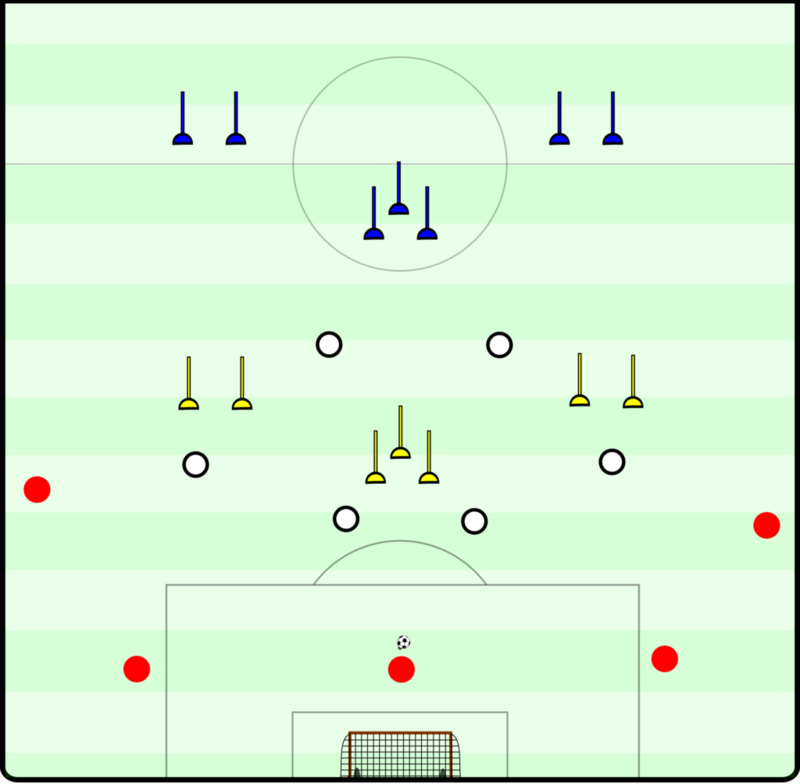 With the difference that passes to the 8 value more than a pass to the 8 the defenders are forced to look more into depth and search for passing options over longer distances, to progress with the ball as much as possible. With my team this didn’t work out well at the beginning because the players often ignored open passing lanes to the 8 as they didn’t check for it. As the drill started to work better I also talked about the positioning of the centre backs who often where to close to the strikers and highlighted the importance of the centre backs dribbling forward with the ball. Obviously the drill can and should be adapted according to the respective defensive formation the team uses. It can make also sense to set up a rule to limit the maximum touches of the build-up players to make the pressing easier and force more losses of the ball.